Derech Etz Chaim football had a big night putting up 50 points on offense and winning both games. QB Gilad Silverman connected with Kobi Shwartzbaum for 3 Touchdowns including a thrilling play at the last second of the second game. DEC received the kick off and dominated in the first game. On the very first drive of the night Gilad found Kobi for a touchdown with Josh Weisel getting the extra point, and that set the tone for the rest of game 1.The defense dominated HAS who went 3 and out with no yardage gained on their first drive. Gilad took over and once again threw a long bomb to Yochi Naiditch for the second TD of the night connecting with Kobi for the extra point. HAS then come back beating the DEC backfield with a long TD pass. Gilad went back to work hitting Pinchas Shwartzbaum with a long pass to set up a touchdown to Yochi. The next DEC drive was set back by penalties but ended on 4rth and goal with a TD pass to Kobi with Yochi getting the extra point. Game 2 was a bit of a different story with a thrilling ending. DEC came right back on the very first play on a long pass to Kobi for a TD plus the extra point with Kobi running it in on a screen. HAS gets the ball back and once again turns it over on downs deep in their own territory but DEC failed to put the game away as Gilad threw his very first interception of the season in the end zone. Gilad calmly took over at the DEC 20 . First play a long pass to Yochi for a first down to stop the clock. Gilad runs on the next play getting out of bounds to stop the clock. With only 6 seconds remaining Gilad finds Kobi on a leaping catch in the end zone DEC wins 20 – 14. Sam Ash was back on D line for a large part of the game getting himself back into things after a long lay off due to a torn ACL. The team is still waiting for Jeff Mally at cornerback, who is recovering from wrist surgery. Noam Silverman played receiver for an absent Avi Aryeh. This weeks game was played at the Bayit Vegan field. 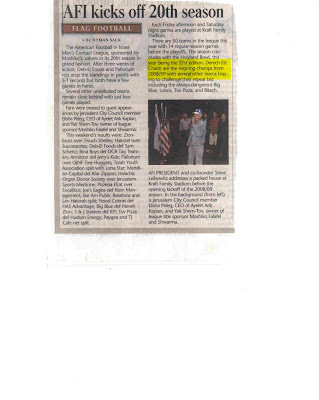 Next week DEC has their 4rth bye with one more off week the second weekend of Chanuka. In the third week of Derech Etz Chaim’s season (games 5 and 6) there were moments when they showed their championship form from last year, but still fell short through some glaring weaknesses on defense and offensive line. DEC game right back with QB Gilad Silverman connecting on a 40 yard pass to Avi Aryeh to tie up the game. Yesod came right back with a long bomb of their own into blown coverage to take the lead 12- 6. DEC had another chance to win the game after an interception by Efraim Prero, who played outstanding defense the entire night, in the end zone gave DEC the ball back with 5 minutes to play. Two passes to TE Pinchas Schwartzbaum another to Kobi, and a run by Gilad put DEC on the 5 yd line but they were unsuccessful in two downs to get it into the end zone and lost the game 12 – 6 . Protection issues on O-line led to the Center Josh Weisel being pulled for back up Aron Hertz who did a great job of keeping out the speedy Yesod defensive line. One highlight was the tentative return of Sam Ash who came in for a few plays and made a difference in bolstering the defense. Sam suffered a season ending torn ACL last year during the playoffs and had to watch the DEC championship run from the side lines helping with play calls. Having recovered from off season surgery he is hungry to win it again. The second game DEC received and made significant adjustments and dominated both on offense and defense. Using their size to run and a number of passes to Pinchas led to a TD in the opening drive. With the extra point caught by Josh Weisel. Yesod went three and out with DEC again driving down field on passes to Kobi, Pinchas, and Avi leading to a diving touchdown by Pinchas on 4rth and goal form the 10. Yesod again capitalized on a long bomb with Prero getting the flag on the 5 yd line. DEC defense held strong through 3 downs but Yesod was able to find the end zone on 4rth to score and convert the extra point score DEC 13- Yesod 7. Stand out on offense was Pinchas Schwartzbaum and on the defense Efraim Prero who has proven to be one of the leagues top CB. Derech Etz Chaim has a number of members of the championship team back. The league is expecting big things from DEC and the team has allot to live up to! DEC Football is back! The 2009- 2010 season with Derech Etz Chaim defending its AFI Championship title began with games on October 24, and 31. After a sloppy opening in the first game DEC has won 3 straight against Excalibur and Klein Management. After two byes this coming Motzei Shabbat DEC gets back to work against the Yesod Cobras. Yesod split their two games with Big Blue and are a formidable opponent. From this point on DEC will be playing every other Sat. night until Chanuka after which they will be playing every week. Follow all the news right here. With starting quarterback Levi Naiditch in the army this week, Yerucham Pliner grabbed the reigns of the offense in Derech Etz Chaim's quarterfinal matchup against Orli Print. During DEC's first possession, Pliner followed beautiful blocking down the length of the field for a touchdown. The DEC offense stalled twice more in the red zone and did not find the end zone the rest of the first half. After halftime, a long pass to Kobi Schwartzbaum led to a touchdown reception by Pinchas Scwartzbaum. The following drive was capped by a catch and run by Sam Ash for the touchdown. With Sam Ash returning to the defense, DEC repeated their shutout performance against Orli Print during the group stage. 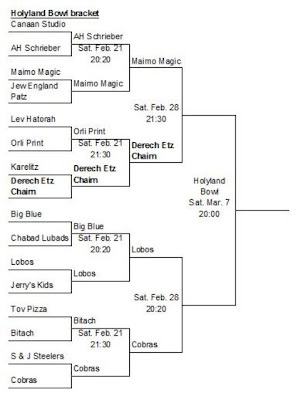 Derech Etz Chaim entered the first round of the playoffs hoping to have their entire team available for the first time since December. Sam Ash, the teams leading defensive lineman, was an idiot and injured himself playing basketball the Friday before the game, hurting the DEC defense and making the game against Karelitz a bit scarier then expected. Karelitz took advantage of the depleted DEC defense and scored on their first three drives while holding DEC without a score. Karelitz led DEC 19 – 0 with less then 3 minutes in the half. At that point the DEC offense sparked by Yerucham Pliner and Kobi Schwartzbaum started to get on the board and DEC was down 19 – 7 at the half. Receiving the ball to begin the second half, DEC put up another touchdown to cut the deficit to 19 -14, but Karelitz came back with another score to lead 25 – 14 with under eight minutes to play. At that point DEC came alive. Levi Naiditch ran the ball and threw two perfect passes as DEC drove downfield to bring the game within reach. The score was 25- 20 with under four minutes remaining. The defense held and Karelitz made a tremendous mistake on 4th and 20 attempting a fake punt which failed, giving DEC the ball with great field position and an opportunity to take the lead. DEC scored on an accurate pass from Naiditch and a great catch to Pinchas Schwartzbaum. The stadium went wild after the successful two-point conversion gave DEC the lead 27-25 for the first time all game with under two minutes to play. DEC held on to win with a crazy crowd and a relieved team to advance to the quarterfinals for the first time! Their quarterfinal opponent this motzei shabbos will be Orli Print, a team DEC defeated 33-0 during the group stage last month. DEC entered the third game, against D&B, without its two starting wide receivers and our starting quarterback. Because D&B had defeated Neve the previous week, a loss would keep DEC from winning the group and would make them dependent on other teams to assure them a spot in the Holyland Bowl playoffs. Last year's quarterback, Yerucham Pliner, ran the offense with a new playbook that relied more on the ground game and screens. The greatest threat to a DEC victory was the fact that five players were playing both offense and defense requiring them to spend more energy than they were used to. The game began with DEC sacking the D&B quarterback for a safety . Unfortunately, Pliner could not get the offense moving and D&B took a 7-2 lead with a touchdown. DEC came back on the next series; on first down, Pliner threw a bomb to Sam Ash to take back the lead 9-7. DEC scored again on a couple of good runs and a pass to Pinchas Schwartzbaum to take a 15 – 7 lead. D&B benefited from our tired defense and missed flags and came back to score and convert a two point conversion to tie the game up 15-15 at the half. A tired DEC re-energized and re-focused during halftime, received the kick off and quickly converted to take the lead 22- 15. On the next drive Pliner intercepted a D&B pass and returned it with a great block from Ash for a touchdown. From that point D&B lost their composure and DEC held on . One more touchdown run by Pliner and the score was 35 – 15 . With the win DEC wins the group with a record of 3-0. This means that DEC will enter the Holyland Bowl playoffs as one of the top eight seeds for the first time. We have three weeks to recover form all the injuries. 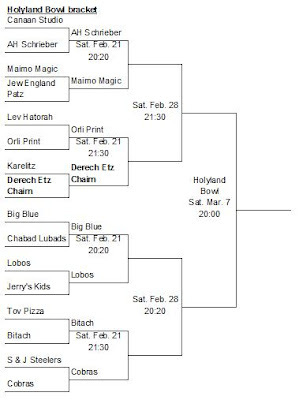 DEC will learn which group runner-up they will face in the Holyland Bowl round-of-16 when the draw is held Motzei Shabbos February 7; that game will be played on February 14. The calendar has turned to 2009, which means that AFI has moved on to the group stage. Derech Etz Chaim played their final regular season game against Neve Tziyon. A rowdy affair ended in a split of the two games. The split kept DEC out of the top eight teams in the standings meaning that DEC would have to settle with a #2 seed in the group stage. As luck would have it, DEC was paired in the same group as Neve, and scheduled in the first game of the group stage to face their opponent from the previous week. This time DEC game out prepared and completely shut down the Neve offense while opening up for a crushing 67-12 victory. The DEC defense, ranked first in the league with the fewest points allowed, shut down Neve so completely that in the first half they gained only negative yardage and did not even complete a pass until late in the second half when the game was basically over. The ferocious front line of Sam Ash, Yaakov "Diesel" Hill and Adam Seibsener got through Neve's offensive line and shut down every play either sacking the quarterback, stopping the run, or pressuring the quarterback into interceptions or bad throws. Jeffery Malley returned one interception for a touchdown and great blocking let Yerucham Pliner return a punt for another. On offense, with #1 receiver Chaim Gross sidelined with an injury, Kobi Schwartzbaum stepped up, catching seven touchdown passes from quarterbacks Levi Naiditch and Yerucham Pliner.